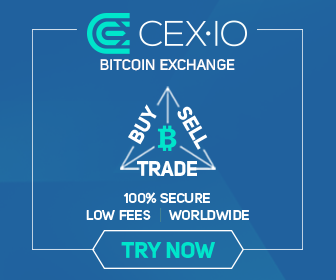 Here's another site like WCX (I'll post a separate review)which has also launched its ICO (Initial Coin Offering) with its 1M ATS shared to the public. ATS simply means authorship tokens that was based from Ethereum Technology that is why an Ethereum wallet is needed whenever you join their bounty reward of 75ATS plus another 10ATS when sharing via twitter and facebook. 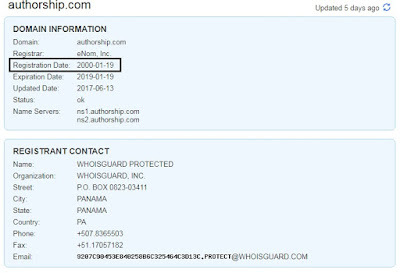 Authorship.com seem to be registered since 2000 as per whois.com so it means they have been around more than a decade. 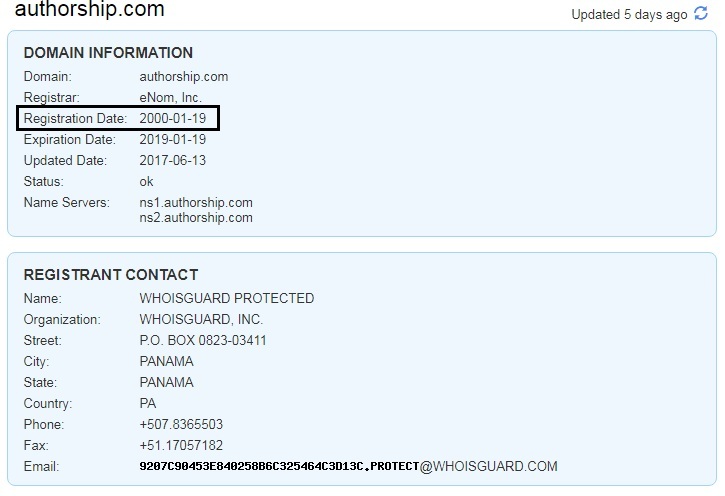 Then who are behind these authorship.com site? Well you can check them directly from their homepage on about us section. Click image to view its full size. 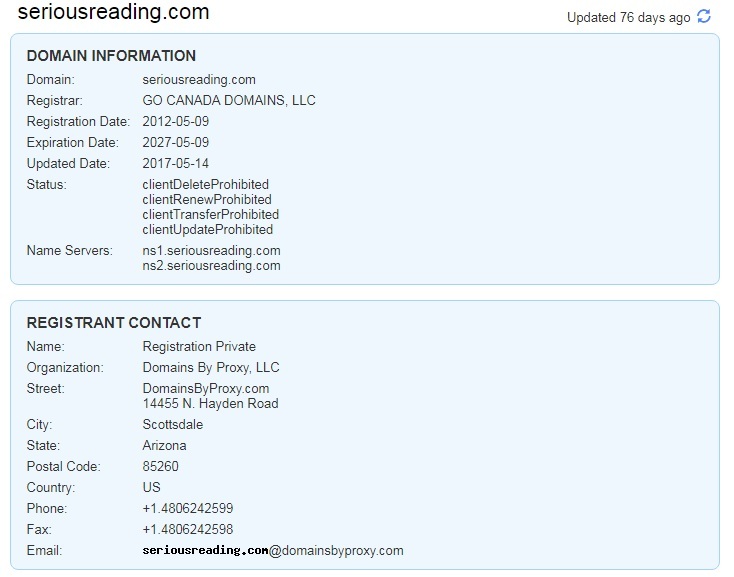 Mentioned from their about us section is they are also behind the two sites like SeriousReading.com and DotWriter.com so if you try to check out from whois.com both also have set their registration details to private. Registration dates where 2012 almost 5 years may quite a contradictory to what they posted as 3 year old book marketing agency, but at least it has been around for that long. Just a sample of number of likes they have garnered for SeriousReading.com above and looking at DotWriter.com homepage below with the robot female that welcomes you to their page which somehow reminds me of letsmultiply.com which I will also make another review. Why do companies go into ICO, well if you are into stocks I assumed you have heard about IPOs (Initial Public Offering) so almost the same with ICO having one objective to raise funds but of course we are talking about cryptocurrency in ICO against fiat money in stocks. 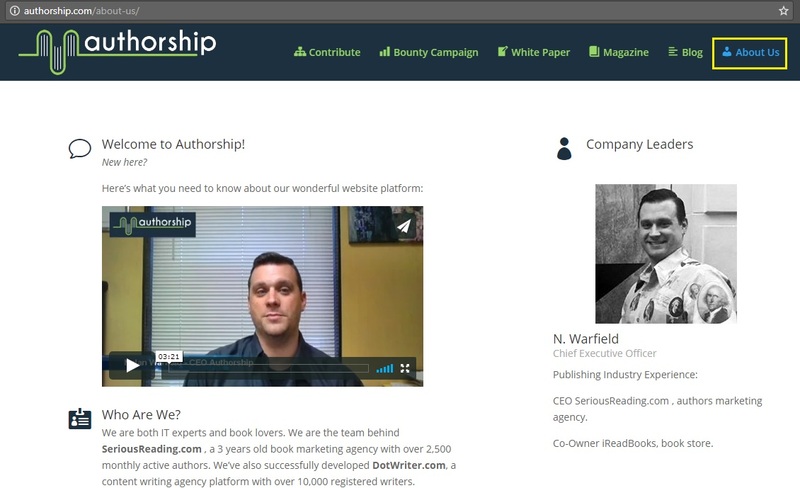 For authorship.com they are trying to raise a minimum of $500K to a max of $15M as shown from sample screenshot below. Click Image to view its full size. 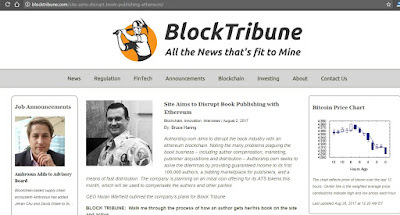 Here's a feature article from Block Tribune that you may wish to read (here). 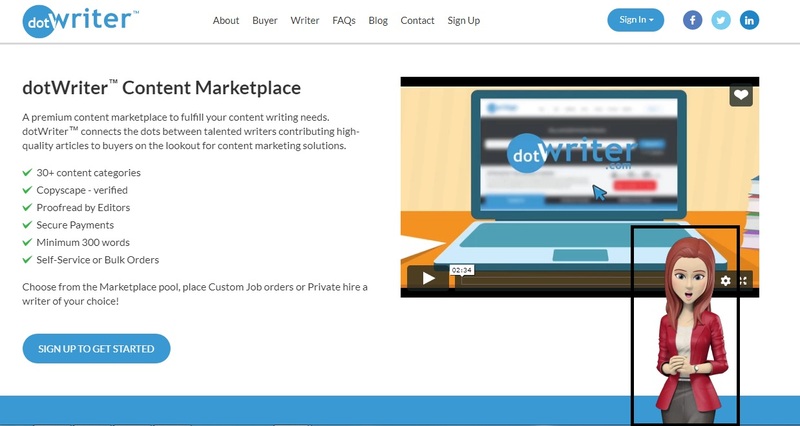 Basically the company is trying to bring in Authors, Publishers and Translators in one platform well of course Readers are included. So authors will try to upload their work in the platform before distributed to readers and at the same time have the option to have it published, wherein this is the stage where interested publishers will join the platform and get interactions with authors were both will be automatically given their shares from sales. Translators? Since not everyone are convenient reading books in English this will open up to interested translators who will be willing to convert to different languages to benefit more readers and of course they also take part of the pie from the sales. 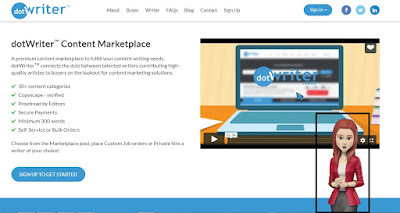 With this, authors will no longer have a problem to where they publish their work so to make it short authorship.com will try to compete with Kindle Publishing by Amazon wherein authors/publishers are given percentage of the sales. You may also try to check it out from their whitepaper (here). So for those who doesn't know it yet they are giving bounty or simply FREE tokens (75 ATS) which almost worth of $10. So how do you get your free 75 ATS worth $10? 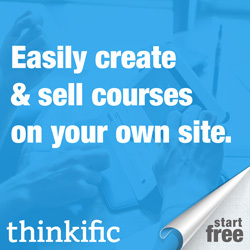 Sign up for free by clicking this link (here). 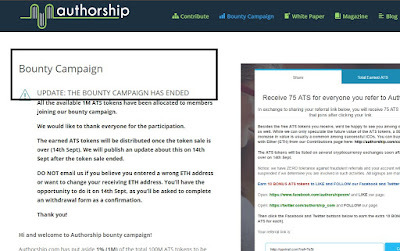 When your at their homepage as shown click on Bounty Campaign. Now fill up the form provided, make sure to have your Ethereum wallet address, if you have no ethereum wallet yet simply create from myetherwallet.com follow tutorial here if you have no wallet address yet. 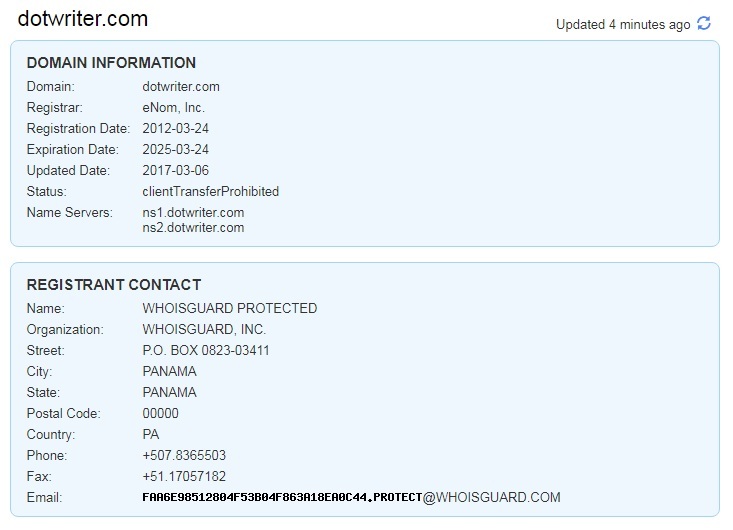 Now wait for confirmation from your email and make sure to verify account. 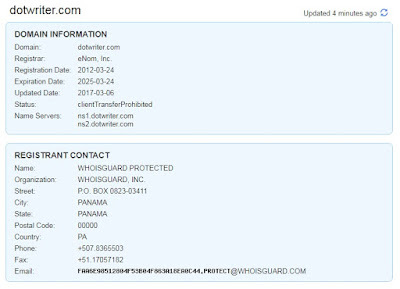 Once you verified your account they will send you links to access your balance and your referral link. 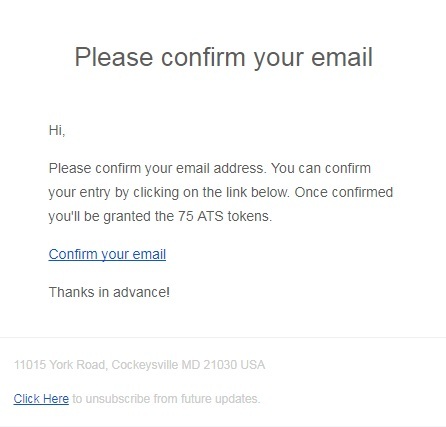 As per email received it states that you will receive notifications for any sign ups from your link. Here's a sample notification. 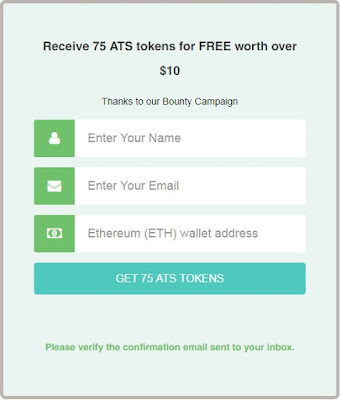 Don't be left behind while they gave out free tokens that is worth $10 as trading price for 1 ATS is $0.15 go ahead and sign up by clicking below and follow steps above. 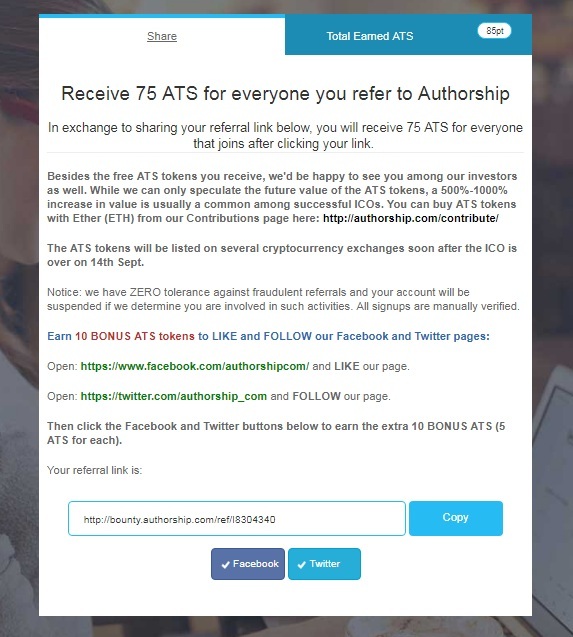 Final say is to join authorship.com as a free member only and take advantage of the free 75ATS given away that you can receive from your wallet after its closed date Sept 14, 2017. 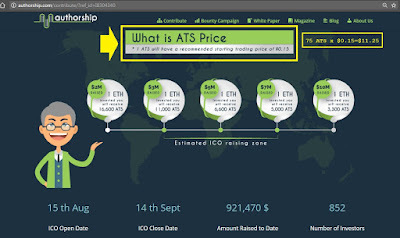 Again as a reminder you don't need to invest as we still give the site with the "benefit of the doubt" since we all heard that these ICO's are prone to pump and dump. 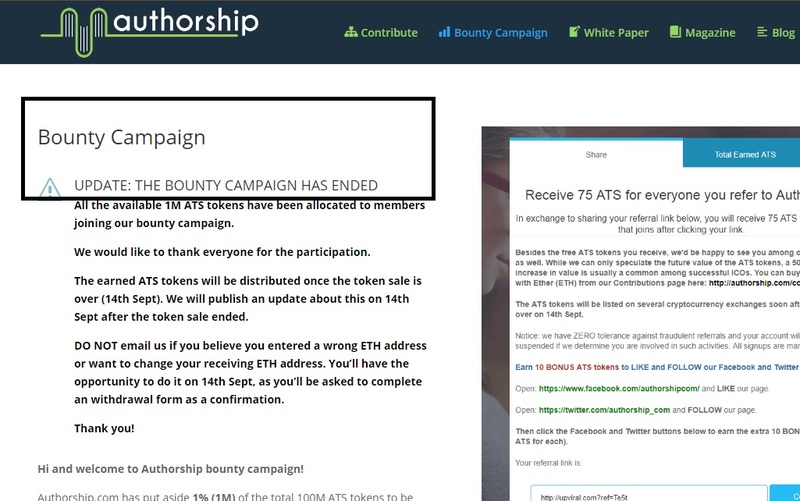 Bounty campaign already ended as posted from Facebook and from their website September 9, please be guided accordingly. Every members who have joined should have received the notification from their email as well. 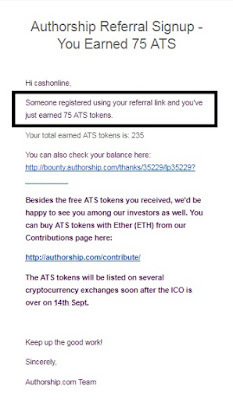 Let's see if they are true to their words after Sept. 14, 2017 that these accumulated tokens will be released to each Ethereum wallet and be included from trading platforms. 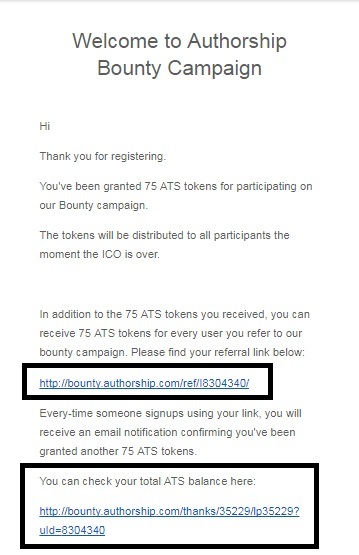 Take note that every member you invite for the bounty campaign both of you gets 75 ATS for free. 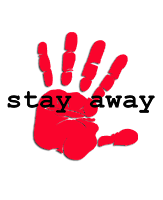 As an update to this most members did not received their token and they have broken their promises, I even read one promoter claimed on the top list or leader board of most tokens did not received his tokens. So many reactions and angry members can be read at authorship Facebook page. "if it sounds too good to be true"
Authorship (ATS) is a platform that will leverage the Ethereum blockchain to provide a new operating model for the book industry. 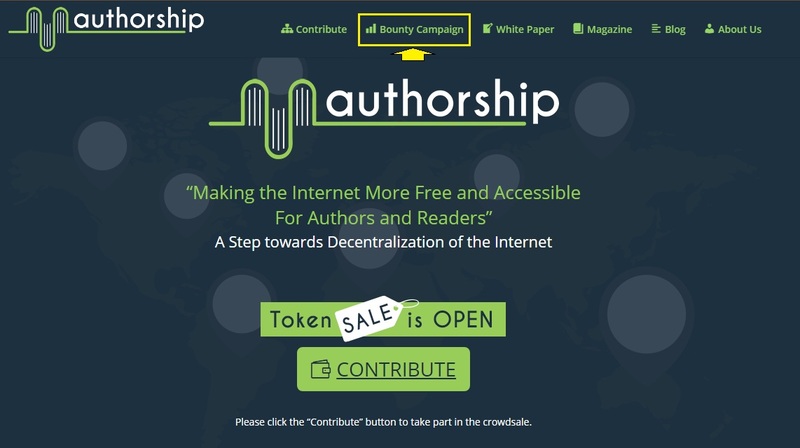 Authorship seeks to close the gap between authors readers publishers and translators creating a platform where all the referred intervenients can share their content. 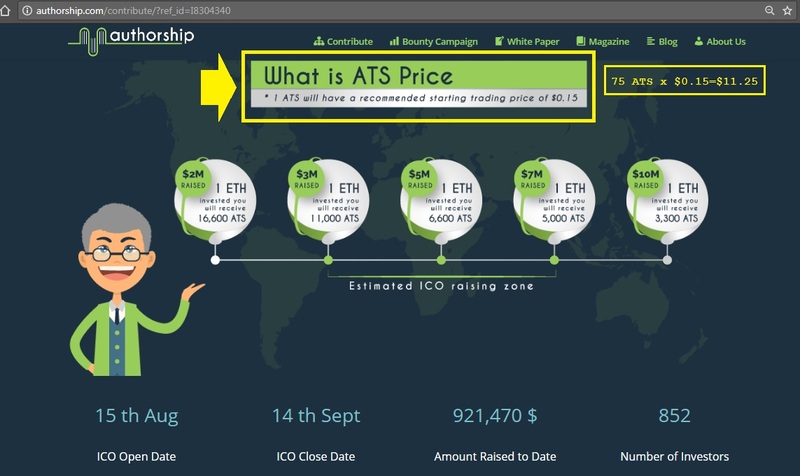 The ATS Token will have several functionalities. For example token holders will be able to buy books or even receive a monthly basis reward (for authors / translators).